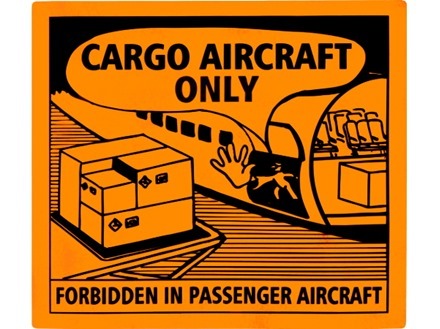 Air freight label. Part of our shipping and handling range for carriage of products by air. Supplied in rolls of 250 labels. Hazard packaging labels. Air freight label. Supplied in rolls of 250 labels. Used in the storage and the transport or carriage of hazardous goods and dangerous substances. These hazchem labels are produced to BS 5609 (for sea water use). They conform with ADR (for road), RID (for rail), IATA (for air) and IMDG (for marine) requirements. HWP1045 Size 110mm x 126mm. Material self adhesive polypropylene, laminated.